Fair Fares - saves $700 a year in transit costs for 800,000 New Yorkers living in poverty and 12,000 veterans attending colleges in New York City for a $106 million investment. Property Tax Reform Commission - to study disparities in property taxes resulting in our district paying higher property taxes than others do for larger homes. Fair Student Funding - school in our neighborhood were chronically underfunded and nearly everyone will see a boost in funding with an investment of $125 million. Accessible Schools - almost every local public school in the neighborhood is not accessible which is why we are investing $150 million in making our schools accessible to every student. Supporting Our Youth - after school, summer programs, summer and year-round youth employment saw restorations and increases of $58.5 million. Expanding Our Libraries - with an investment of $60 million for new libraries and $16.7 million to keep them open. Cleaning Up Our Parks and Streets - we’ve invest $15.8 million in Parks Maintenance workers, tree stump removal and extra sanitation services. More Affordable Housing - we need need more affordable housing for all New Yorkers including $40 million for public housing infrastructure, $3 million for homeless youth shelters, and $500 million for senior affordable housing. Upper East Side, NY- The New York City School Construction Author ity broke ground today on construction of a new Pre-Kindergarten facility located at 355 East 76th Street. The new site will help the Department of Education meet the demand for seats needed in the 2019 school year with 180 initial seats for fall of 2019. This new push from the City to build and open more Pre-Kindergarten seats on the Upper East Side comes after years of public advocacy from Council Member Ben Kallos and local parents to the Department of Education to fulfill the area’s need and live up to the promise of Pre-Kindergarten for all children in New York City. For the 2017-18 school year, 736 families applied for a total of 550 Pre-Kindergarten spots in the Upper East Side and Roosevelt Island, though not every application was from a family living in this area or materialized into a student enrolling in a Pre-Kindergarten seat. The unmet demand forced parents to consider enrolling their children in Pre-Kindergarten sites as far away as downtown Manhattan. This push by the City to increase the number of Pre-Kindergarten seats in Council District 5 includes another 234 seats will come from other new centers on East 57th and East 95th Streets for a total of over 400 seats. 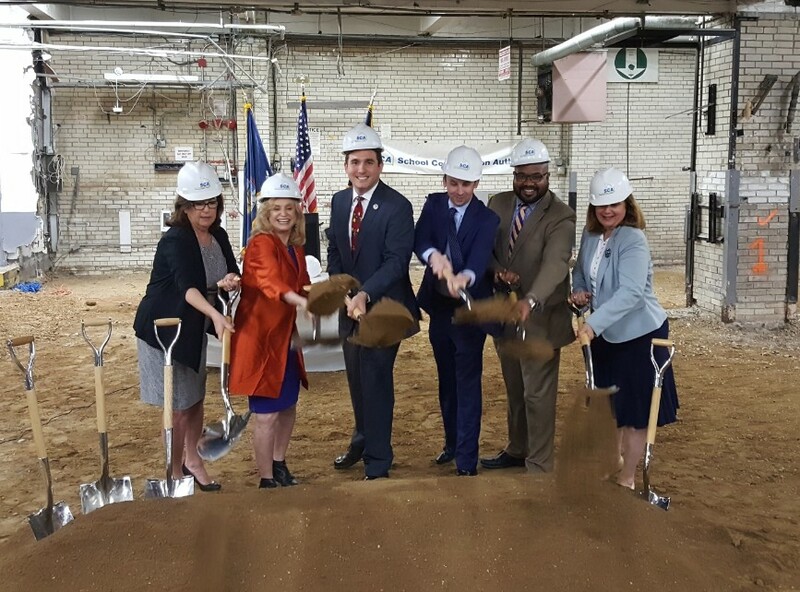 The groundbreaking ceremony was attended by Congress Member Carolyn Maloney, and neighboring Council Member Keith Powers. Representatives from the offices of State Senator Liz Krueger, State Assembly Member Rebecca Seawright, and Manhattan Borough President Gale Brewer were present as these were the elected officials that have been supportive in Council Member Kallos’ four-year effort to increase the number of Pre-K seats on the Upper East Side. These new seats were originally announced by Mayor Bill de Blasio in January as part of Fiscal Year 2018 Executive Budget. New York, NY – Parents interested in having a say in local government could have free childcare provided by the city under proposed legislation by Council Member Ben Kallos. The legislation is being announced ahead of Mother's Day and will be introduced within a few days. The bill was inspired by a move to provide childcare at conferences in academia, civic technology, and by NYC Community Education Council 2. Countless parents have found childcare to be a challenge to their professional careers, not to mention civic engagement. New York, NY, May 23, 2018 — The world’s leading voluntary health organization devoted to fighting cardiovascular disease and stroke, the American Heart Association backs Council Member Ben Kallos’ bill designed to take sugary drinks off the kids’ menu in New York City restaurants. The bill aims to make healthier drinks like water, low-fat milk and 100% juice the default option on kids’ menus. By passing this policy, New York City will join a growing number of cities setting healthy standards on kids’ restaurant menus to promote children’s health. Today, the majority of children’s meals at most restaurants are unhealthy. Although parents could still choose from any drink, this policy will help make the healthy choice the easy choice. "The new normal should be healthy meal and drink options for our children no matter where they are eating, "said Council Member Ben Kallos. "If we get this part down, at every food establishment serving kids it will make it much easier and simpler to raise happy healthy children." New York, NY—Over 1,900 Upper East Side and Roosevelt Island residents 11 years old and over voted in person or online on how to spend $1 million in tax dollars to improve the community as part of “Participatory Budgeting 2018 cycle.” This year residents were able to vote in the district office seven days a week as well as at multiple mobile “pop-up” voting locations and online by digital ballot. The three highest voter winners will be funded for a total of $750,000. Due to a strong showing and a close final tally in votes the fourth project on the list of winners with a total cost of $600,000 will be given the remaining $250,000 from the $1,000,000 in Participatory Budgeting money plus an additional $350,000 from Council Member Ben Kallos’ discretionary funding to complete the project. Upper East Side - NY. I am grateful that the injury resulting from this incident was not life-threatening and that the resident was able to walk away from it however potentially deadly debris should not be falling out of the sky and onto New Yorkers ever. In addition to having a bill that limits the amount of time scaffolding is up unnecessarily, I am looking into introducing legislation that would make ensure scaffolding that is up is inspected effectively so that it is safe and actually protects pedestrians in the event of an accident. I will certainly be following up with the Department of Buildings as they investigate what exactly occurred here. These structures are meant to keep people safe and if they are not doing that job correctly we need to fix that. Council Member Ben Kallos represents District 5 which covers First Avenue and East 57th Street where the incident occurred. Since its inception in 1988, New York City has had the model campaign finance system in the country. It is a system that has survived court challenges, been strengthened by legislative changes, and helped candidates like me compete and get elected. It is a system I am invested in protecting and improving upon during my time in the City Council. But no system in perfect, especially not one as complex and impactful as campaign finance. There is room for improvement, and I offer to this commission proposals large and small that will create a fairer campaign finance system by shifting the balance of power away from the wealthy and well-connected, back toward the people it was designed to serve. I urge this Charter Revision Commission to consider modest changes to the existing Campaign Finance system that would not put the existing system at risk, while still having a large impact. Match Every Dollar with a Full Public Match – increase the public match from 55% to 85% of the spending limit to match every small dollar. Increase the Match on Small Dollars over Big Money – match small dollars contributions of $100 or less at a higher rate than larger contributions. Lower Contribution Limits – lower contribution limits to $2000 for citywide and $1000 for borough and City Council because you should not be able to give more to a mayoral campaign than a presidential. Democracy Vouchers - provide residents with vouchers to be used toward campaigns. Ballot Access Reform – automatically allow residents who qualify for public matching to be on the ballot as an alternative to archaic petition requirements. End the Revolving Door between New York City and State: Life Time Term Limits – elected officials may only complete two terms total per office. In-district Residency Requirement –candidates must reside in the city for at least 5 years and within their district for at least 1 year. Empower the Voice of Residents Over Big Money – Independent expenditures are on the rise and we must limit the influence of big money to amplify the voices of people over corporations. Clean Elections – prohibit private money in candidate campaigns. Act Now – 2021 presents a unique opportunity to enact reform. Upper East Side, NY –The Brearley School, the Department of Citywide Administrative Services, and Council Member Ben Kallos have formed a public-private partnership to rebuild and maintain a platform known as “The Pier” that had fallen into severe disrepair with rain leaking through onto John Finley Walk on the East River Esplanade. As part of a new lease agreement and in response to concerns raised by Council Member Ben Kallos, the Brearley School and the Department of Citywide Administrative Services have agreed to invest over $1 million to rehabilitate the Pier. CIVITAS, the Council Member and representatives from the Brearley School will host the public for a preview of the plan on Thursday, May 10, 2018 from 6PM to 8PM at the Brearley School. The plan will incorporate colorful new designs, contemporary lighting, green walls, and new planters with seasonal plantings maintained through a partnership with a local conservancy. The new Brearley lease will run for the next 20 years, with two 10-year renewals. Previously, the City was responsible for the pier infrastructure. As part of the new lease, the School is taking on that responsibility along with the voluntary renovation and beautification that will be carried out as part of the public-private partnership. In addition, Brearley will post contact information for residents to report any issues. Routine maintenance issues reported will be fixed within days or weeks, and updates will be posted regularly in the event of any larger issues. This new public-private partnership was a result of community meetings and surveys with CIVITAS, and Council Member Kallos and Brearley working with the Department of Citywide Administrative Services to address community concerns. A detailed history and the full terms of the agreement are listed below. New York, NY – Light pollution can harm wildlife and make it hard to stargaze let alone for New Yorkers to get a good night’s sleep. Under new legislation from Council Member Ben Kallos, street lights would be “fully shielded” to stop them from shining up into the sky or the windows of nearby residents, instead only illuminating the sidewalks and streets intended. New York, NY – In order to support the City’s Zero Waste goal by 2030 and improve the city’s dismal recycling rate, legislation introduced by Council Member Kallos would require source separation to be available in any place of public accommodation with bins for trash, recycling, and compost. Additional legislation would require New York City reach its goal of Zero Waste - diverting all waste from landfills — by 2030, regardless of the next Mayor. Both bills will be introduced on April 25th at the City Council's stated meeting. New York, NY – Following President Trump’s repeal of a six-year ban on selling bottled water at national parks that had reduced plastic pollution and waste, just in time for summer, the New York City Council is introducing legislation to block the sale of single-use water bottles or any plastic water bottles in city parks and beaches. The package of legislation targets city government concessions including those operated by Trump such as Wollman and Lasker rinks as well as the Ferry Point golf course. Information about the availability of LinkNYC's free phone service will now be shared online.. This real-time, up to the hour monitoring will ensure residents are able to find free phones that are working whenever they need one. In the past, public payphones often didn't work: picking up a handset that had no dial tone or had been damaged become normal; sometimes booths were empty with no phones inside. With the upgrade from payphones to LinkNYC kiosks offering 911 and free phone servie, the City is hoping to make broken public phones a thing of the past. "Even in a world where almost everyone has a smartphone, my battery still dies every day, and I find myself relying on LinkNYC terminals to make calls while I charge my phone, more often than I thought," said Council Member Ben Kallos. "Upgrading our payphones into free phone and wifi kiosks has created an opportunity to use new technology tools to keep our city's infrastructure online and up to date." New York, NY – One year after the opening of the Second Avenue Subway and fully protected bike lanes, the new pedestrian islands are getting 19 new trees valued at $38,000 and provided by the MTA, and 17 new tree guards to protect them and plantings at the cost of $30,600 provided by Council Member Ben Kallos. This is an expansion of his Adopt-A-Planter program launched in 2014 along the First Avenue protected bike lane. As covered by PIX 11 News in 2014 by Council Member Kallos secured approvals from NYC Parks and the Department of Transportation for residents to adopt planters with and without trees to beautify them with training and materials from Upper Green Side. Over the past four years, the Adopt-A-Planter participants have requested tree guards to protect trees and plantings. "I am proud to see New York City step into the forefront of cyber security by protecting not only local government and businesses but also residents throughout the five boroughs via a new convenient and free app," said Council Member Ben Kallos. "New York City is the center of the universe and for that reason alone our city and its residents are targets of scams like phishing, ransomware and identity theft. NYC Secure will give New Yorkers a much needed added layer of protection on their mobile devices. Thank you to Mayor de Blasio for having the foresight and courage to invest time and resources in this initiative." New York, NY- Council Member Ben Kallos testified Tuesday before the Board of Standards and Appeals (BSA) in opposition to the construction of a mega-tower in the recently rezoned East Fifties residential neighborhood. Despite the rezoning, which was the result of a grassroots effort by the local community and elected officials, the developer, Gamma Real Estate, is appealing to the BSA in an effort to exempt its property from the new rules. Council Member Kallos joined fellow elected officials, civic groups, and dozens of members of the East River Fifties Alliance (ERFA) in opposing this application for a super-tall building in a residential neighborhood. In November of last year, the City Planning Commission approved the ERFA application, but included a grandfathering clause designed to exempt 428-432 East 58th Street, the Gamma building, from the new rezoning. All of the rezoning’s co-applicants called for the grandfathering clause to be removed by the City Council, however, and the Council removed the exemption in the zoning text with a resounding 45 in favor, 0 against, and 1 abstention, leading the developer to appeal to the BSA. At the hearing, Council Member Kallos presented testimony on behalf of Senator Liz Krueger, Council Member Keith Powers, and himself, arguing that efforts to rezone the Sutton area by the community were underway and known to the developer prior to them even purchasing the property, and so no special accommodation should be made. While the BSA has the power to allow construction to continue in cases when the zoning changes, catching by surprise a developer who has begun work on a building, in this case the developer bought the property at a discount knowing about the planned zoning changes and instead of slowing construction activity to ensure compliance with the Zoning Resolution, they hastened it, relying heavily on illegally granted After Hours Variances and even doing work at times without permits. Thank you to Chair Perlmutter and the members of the Board of Standards and Appeals for the opportunity to testify today. We are here to strongly oppose Sutton 58 Holding Company LLC’s request to exempt its development at 428-432 East 58th Street from zoning text that is the result of a community-led grassroots zoning text change approved by Community Board 6, Manhattan Borough President Gale Brewer, the City Planning Commission, and the City Council. We are proud to represent the community surrounding the site that is the subject of today’s hearing. The effort by a the East River Fifties Alliance, a community group with over 2600 members, to rezone the narrow streets east of First Avenue between 51st and 59th Streets and the progress being made in the ULURP proceeding for that rezoning were publicly known to the developers, not only before they began laying their foundation, or before they applied for the permits, but before they even purchased the property. As the Board is aware, the vesting provisions of the Zoning Resolution are designed to protect owners of real estate from unforeseen zoning changes which unfairly restrict development after properties are acquired. In this instance, however, the applicant acquired the property with full knowledge of the planned zoning restrictions, and thereafter, rather than slowing construction activity to avoid potential prejudice, increased it, often working beyond the hours permitted by existing permits. The applicant is seeking to turn the vesting provisions of the Zoning Resolution upside down. Section 11-331 of the Zoning Resolution, which allows construction under certain conditions, is being subverted by the applicant for the purpose of creating an unfairness. After the zoning change was adopted, the applicant continued to perform construction work on the building, proceeding at its own risk and in bad faith, even though a full stop work order had been served on December 1, 2017. The applicant has since argued that I intended for the developer to seek recourse through the appeal process to the BSA under the vesting provisions of ZR 11-331, as they have done. The intent of this comment was only to state that it was the developer’s right to appeal to the BSA, and in no way an endorsement of the validity of such an appeal, which I am here today to wholeheartedly oppose. This work to complete this foundation was done with illegal After Hours Work Variances. After Hours Work Authorization may only be granted for one of five reasons specifically enumerated under §24-223(e) of the Administrative Code. The After Hours Variance applications in this case cited a reason of “Public Safety” and were approved for “Other,” but the description of work included only work that does not qualify for “Public Safety” and which was also done during regular hours. The Board of Standards and Appeals must make a finding of fact as to each of the After Hours Work Variances. It must determine whether such authorizations were properly based on any of the five enumerated reasons. Any work authorized for “Public Safety” reasons must not include work that is also done during regular hours without that same public safety concern. Finally, any foundation work done under an After Hours Variance in violation of the law may not be counted for the purposes of establishing a foundation. Given the facts, the Board should find that none of the After Hours Variances were properly issued, thereby disqualifying any and all of the foundation built during those illegal After Hours Variances. Once the rezoning application was nearing a final vote, the developers began to take last resort actions in an attempt to convince this board that their property should be exempted from the impending rules. These actions included doing work for hours after their permits expired and simply doing work with no permit at all. The issue of fact in this proceeding is whether the foundation is substantially complete, and the Board of Standards and Appeals has a long tradition of independently inspecting sites. However, while the developer was preparing their appeal to the Board of Standards and Appeals, and even after filing this appeal, the developer continued work on the building in question, concealing, altering and destroying the physical evidence of progress at the time of the zoning change. In light of the concealment and alteration of the physical evidence of the building’s construction on the day of the rezoning preventing any independent evaluation and analysis, the BSA must not reward this act, and must assume that the building was not substantially complete. Should the BSA not make this assumption, it must require that the developer provide details and supporting documentation for all work done since adoption. This Board serves a crucial purpose, to ensure New York City’s Zoning Resolution is not so rigid that commonsense and fairness are erased by rules for rules’ sake. Specifically, the power to vest properties into the zoning code as written at the time the building’s foundation is completed is an important way of ensuring that developers are not surprised by changes to city law, finding themselves in a situation where they have just poured their savings into something they can no longer afford. The scenario you are considering today is a distortion of the spirit of this law. The developers did not find themselves stuck with a foundation they could do nothing with. They poured their foundation illegally, partially in the final hour and partially after midnight, as a last-ditch effort to convince this Board that they were stuck with it and should thus receive special dispensation. A total of 1701 cubic yards of this foundation was poured utilizing unpermitted street closures. Of that, 180 cubic yards of cement was poured after the applicant’s permit expired. An additional 300 cubic yards was poured on the day of the zoning change’s adoption, and so it is not considered. Only 93 cubic yards of cement was poured without cutting any corners, with the permission of our city’s agencies. All the while, the developer did work utilizing illegally granted After Hours Variances. This is not substantial completion of a foundation. This is an attempt to avoid the law. Please vote against approving this applicant’s request, in order to maintain the integrity of the zoning code and of this residential neighborhood. NEW YORK—Mayor de Blasio joined crash survivors, victims’ families, seniors and elected officials on the steps of City Hall to demand leaders in Albany include an expansion of New York City’s school zone speed enforcement camera program in the final state budget by April 1. With the program slated to expire in June, the City and advocates are seeking not just its extension, but major improvements. Where installed, speed cameras have been proven to reduce speeding in New York City school zones by 63 percent, with injuries to pedestrians dropping 23 percent. But under the current restrictions, 75 percent of the children who were killed or severely injured in traffic were hit at locations or at times where the City can’t legally use a camera. For example, cameras cannot be installed on 9th Street in Park Slope—the site of a crash that killed two young children this month. The New York State Assembly included reforms in its one-house budget bill that increase the number of school zones where cameras are allowed, and allow them to be placed on more dangerous streets. "We have a duty to protect our children from being killed in a collision that could be prevented by a simple traffic camera," said Council Member Ben Kallos. "Some of the most dangerous intersections where we should not have lost any lives are within feet of schools in my neighborhood. We need traffic cameras anywhere someone has been injured or killed, especially near schools." NEW YORK – Mayor de Blasio today announced the launch of NYC Secure, a pioneering cybersecurity initiative aimed at protecting New Yorkers online. Using a steadily evolving suite of solutions, NYC Secure will defend New Yorkers from malicious cyber activity on mobile devices, across public Wi-Fi networks, and beyond. The first NYC Secure programs will include a free City-sponsored smartphone protection app that, when installed, will issue warnings to users when suspicious activity is detected on their mobile devices. The City additionally announced new world-class protection for its public Wi-Fi networks, becoming the first city in the world to provide such services to all residents and visitors free of charge.